The title says it all. Usually when I need something fast that I know all my kids will like I go with Breakfast for dinner. Anything my kids can put syrup on is never a fail in my home. Pancakes, waffles, french toast or even scones. Yup I once told my kids scones were pancake balls so to this day they cover them in syrup. I think french toast is one of my favorites. Granted I like to make my french toast with texas toast. This is something I had to actually make a habit of keeping in my pantry just so I could make french toast in a pinch. My favorite thing to add to the toast is a syrup I got from a friend a few years ago that she called Magic Syrup. This is how you make magic syrup. In a saucepan melt 1 cube of butter; add 3/4 Cup of sugar and 1/2 cup of buttermilk. I don't usually have buttermilk on hand even though it is cheap and lasts a long time. It's OK if you don't just do milk and about a half a Tablespoon of white vinegar. Boil this then add 1 teaspoon of vanilla and 1 teaspoon of baking soda. 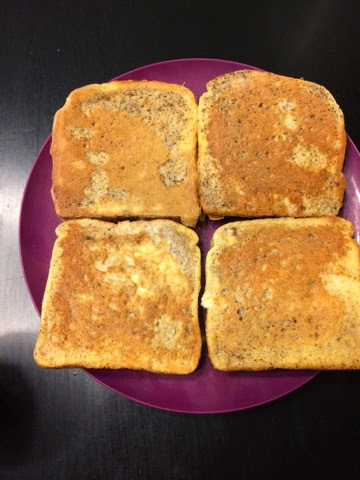 My kids love to scoop out the bubbles onto their toast.